The Vega is seen by many as THE digital audio processor in its price range. In this review I will investigate how the Vega compares to the Rein Audio X3, SOtM SDP1000, Ayre QB9 and Jeff Rowland Aeris. 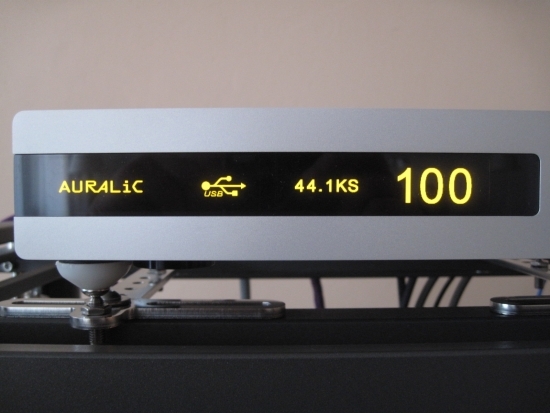 The Auralic Vega is not just another DAC: it is a beautifully finished, highly sophisticated DSD/DXD-capable (2.8MHz as well as 5.6MHz) Audio Processor. In essence it is a DAC but it makes sense to call it a “processor” because it upsamples all incoming PCM signals to 32bit 1,5MHz before converting to analog, instead of employing standard (integrated) DAC circuits. This upsampling allows for digital filtering at much higher frequencies, with less audible tradeoffs but it also provides so much headroom that the digital volume control does not affect resolution, in theory. 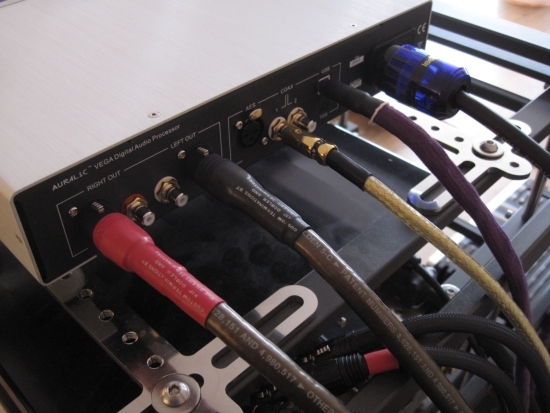 Inputs are USB, toslink, AEX/AUB and 2x Coaxial digital. Output signal is available on XLR and cinch. AES/EBU and coaxial inputs accept up to 24/192 and USB input accepts any signal including double rate, 5.6mHz DSD and DXD (32bit 384kHz PCM). 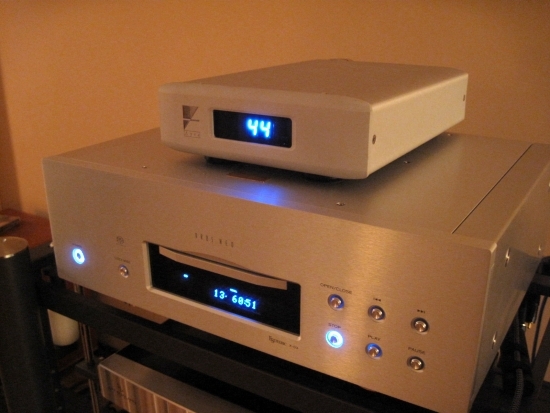 Impressively, the Vega includes a Femto clock and has a Class A output stage. Its USB input works according to the popular Asynchronous Mode and is buffered by Auralic ActiveUSB technology to further reduce jitter levels. Further, the DAC, erm, Processor, is compatible with Windows, Linux and Mac sources. Mac OSX 10.6.4 and above, as well as some versions of Linux natively support the Vega but for some instances you will need to install a driver. The software is included, as are detailed installation instructions in the manual. Its display has got to be one of the nicest implementations that I have seen: informative, high-res, easily readable from a large distance and with a very wide (unlimited, really) viewing angle. I wish my Aeris had a display like this! The display is also used in combination with the rotary control when making changes to the many settings in its menu. Operation is simple: click it to enter the menu, rotate to select an item, click again to select the item and make changes to it. I won’t go into all the possibilities but most noteworthy are the clock and filter settings: Clock can be set to auto, coarse, fine and exact and Filter can be set to 4 modes, basically minimum phase (default), flat, gentle roll-off and smooth. First using standard settings (Auto Clock, Filter 4, Volume 100), I listened to the Vega in combination with the AAZ Ultra Flow music server. Although the Vega was said to be run in, I left it playing music for a few days, just to be sure, but naturally I also listened to it right after connecting it up. First impressions, using an Audioquest Diamond USB cable and an Isotek EVO3 Elite powercord were of a lively, articulate, neutral, transparent and highly resolving sound. Perhaps it was a little bit too crisp and controlled at first but very convincing nonetheless. Resolution in particular was top-notch, and there was no sharpness or edgyness anywhere. Continued listening, that first evening, sustained my initial thoughts about the Vega’s sound and because I felt no need for cable swapping, I just left the unit playing that night and the next day. The next evening, listening resumed. By then my overall impression had changed somewhat: the sound was still impressively transparent, refined, detailed and neutral, but overall more relaxed, which for me is a very good thing. But in the process, the Vega’s timbre had become less natural, less convincing. I often describe the effect that I now heard as “synthetic” but I realise that not many people will understand what I mean by this. I find it difficult to describe this property effectively and the best I can come up with is that piano sounds a bit like a synthesized piano or overall, wooden sounds sound less wooden than they should to be convincing for me. Swapping to the Levinson 390S using its built in DAC or using the Jeff Rowland Aeris confirmed my feelings about the Vega’s timbre. But these components cost multiples of the Vega’s entry price and so they don’t make for a fair comparison at all. So, I arranged some more comparable DACs. First DAC up for comparison was the Rein Audio X3. At around 1000 euro it is much more affordable than the Vega but this shows in its spartan exterior and functionality. Read more about the X3 here. The X3 produces a very articulate and dynamic sound. It isn’t as finely resolving or as airy as the Vega, nor does it have much of a soundstage, or layering therein. It can be a bit too controlled, sounding overly tight, it lacks fluidity and flow, and I wouldn’t call it an alternative to the Vega by a long shot, but to me, the Rein has a more believable timbre than the Vega. 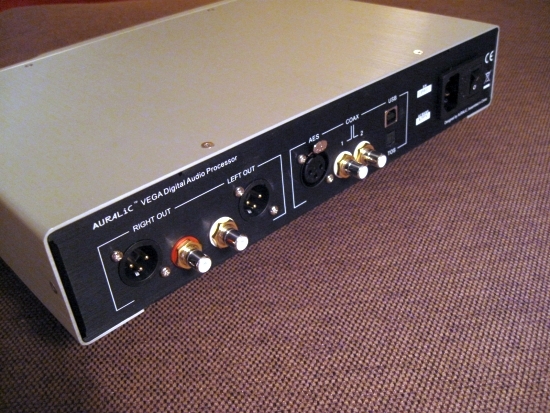 Second DAC for comparison was the sDP-1000 at around the same price as the Vega. This was much more of a fair comparison, not only price-wise, but also because this DAC is from China as well. (Strictly speaking the Vega is from Hong Kong). The sDP-1000 is described extensively here so I’ll move straight on to the comparison. Although the sDP-1000 can play DSD, I played only PCM, using filter setting X2. The sDP-1000 sounds more relaxed and laidback than the Vega, almost in a typical English fashion. Its soundstage is also slightly withheld compared to the more forward Vega and overall it sounds less impressive. The sDP-1000 also has lower apparent resolution and is less articulate throughout the frequency band, perhaps most noticeably in the bass, which is not only faster, but also more powerful with the Vega. Technically, the Vega beats the sDP-1000. Still, I’d hesitate to call the Vega better on all accounts because I also like the sDP-1000’s free flowing sound. Rather, it’s a tie, with both DACs catering to different tastes. With some music, it can sound quite magical. Ultimately though, if I had to choose, I’d go for the Vega, and try to smooth it up a bit. Interestingly, the sDP-1000 has the same kind of a less natural timbre as the Vega does. Both sound equally less convincing with wooden instruments or big percussion than some others. Third DAC for comparison was the Ayre QB-9 that comes at around the same price as the Vega. Compared to the Vega, the QB9 sounds very relaxed and paints a more enveloping soundstage in which music flows more freely, even more so also than with the SOtM. The Ayre QB9 has a leaner overall balance, is less articulate, with lower resolution and less focus, but somehow it sounds more natural and more magical to me. It comes closer to matching the emotional aspects of the sound of the Rowland Aeris. Then again, the Vega comes closer to matching the more technical aspects of the Rowland Aeris. So, I guess that it comes down to what you’re after. If you want the best transparency, articulation and resolution, go with the Vega. It is the obvious cerebral choice and at its price nothing that I heard beats it. If you are after a more emotional bonding, even if that means lower scores on the technical marks, the QB9 is the more corporal choice. Also do note that the aspect of timbre may be much more evident in my system because of the supremely transparent and open-sounding Apogee ribbon speakers. Cabinet speakers or smaller rooms with more room modes may conceil this aspect so effectively that it becomes a non-issue. Apart from its timbre, everything the Vega does is actually very good: bass is deep, tuneful and has good weight and speed. 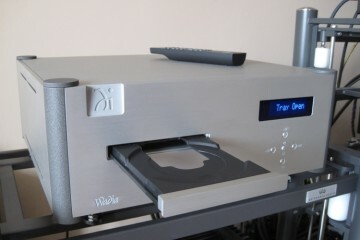 While not Wadia/Levinson/Rowland territory, its bass is definitely much better than most other DACs. Midrange is perhaps a touch lean. It definitely isn’t threadbare or something but for me it could carry more weight and colour. You could also say that the Vega’s midrange is less coloured than some other DACs. Treble, as hinted at above, is pure, clean, extended and wholly free from edge. That’s something I value highly in any audio device. 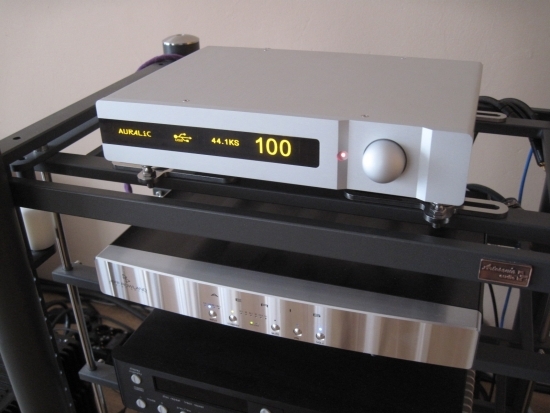 Some DACs have a narrow soundstage or a very wide one by default. With the Vega however, soundstage is as large as the recording permits, which is neither shrunken nore exaggerated, neither shallow nor deep. It is just expansive or cozy, as needed. While I like and prefer a big soundstage, the purist in me would say that the Vega’s soundstage is probably just about spot on. So far for soundstage size. But the quality of the imaging itself can be bettered. Wadia CD players for example are a class apart, and have the ability to throw an even more eneveloping, more 3D soundstage, still, only when the recording asks for it. Within that stage there is more depth and better layering than I hear with the Vega. The PS Audio PWD MKII DAC also does this trick to some extent. To be fair: apart from Wadia CD players and the PWD MKII DAC, nothing else I heard does imaging as well. It’s something analog turntables can also excel in. Admittedly, even my Aeris does this less well than the PWD MKII. So, it is not the Vega’s fault, nor is it something to be sad about. 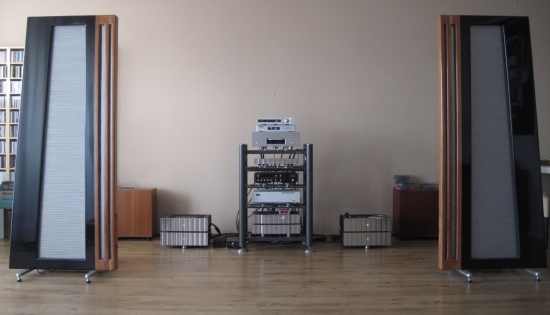 If you haven’t heard, or don’t like, the Wadia sound, there is nothing you’ll miss. The Vega’s dynamics are excellent, jumping from soft to loud in an instant. Speed is spot on: the Vega sounds neither slow nor hurried. In many ways the Vega sounds like the perfect product, and it is indeed very well-balanced. 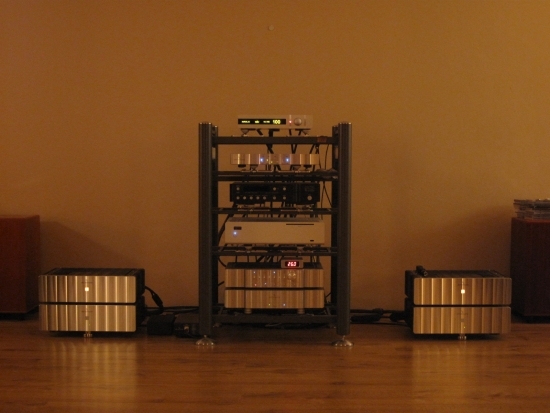 Because it doesn’t set a foot wrong, I can imagine that it will win many an audiophile’s heart. And that’s before going into the various clock- and filter settings, or DSD playback, for that matter. Coaxial sound is similar to USB sound which votes favorably for the Vega. Too many DACs I tried sound, better with one or the other input. The Vega has a Femto clock built in, named that way because its jitter is so low that it is measured in femtoseconds. This allows extra tight clock tolerances for the digital inputs, which normally translates in better sound. But because not all sources are low enough in jitter, the Vega also caters to more jittery sources by means of a range of selectable clock options in it setup menu. There is Auto, coarse, fine and exact. Auto automatically choses the best mode according to source accuracy, leaving out the exact mode. Coarse allows the Vega to lock even on very jittery sources, but it is also the least accurate setting. Fine is for use with high quality sources and Exact is for use with only the best sources. The Exact setting can’t be chosen before the Vega’s Femto Cloc’s temperature has stabilized. Right after plugging it in, this will take about an hour. If you use sleep, the clock remains active and can thus always be used in exact mode. As long as the source is up to it that is. The manual states that some computer sources may exhibit drop-outs but I have not experienced this using the AAZ Ultra Flow, which admittedly has a highly accurate USB output. Auto mode is what I used for all testing thus far. Compared to Exact mode, Coarse mode sounds more fluid and relaxed but also indeed less precise and a little woolly overall. In exact mode, the Vega has the tightest bass and best focus. Fine mode sounds much the same as exact, perhaps a little more relaxed. Interestingly, I felt that the Auto mode gave the best balance between accuracy and natural flow. Filter 4 is default and it is what I used for all testing thus far. This filter sounds cleanest and tightest and has the best bass. Filter 1 is smoother, with a more free-flowing soundstage. Filter 2 sounds rolled-off and although the sound is friendly, it is difficult to forgive the lower overall perceived level of detail. Filter 3 offers a balance of transparency and fluidity, sounding better to me than filter 1. Overall, I prefer filter 4 because it comes closest to the powerful Wadia/PS Audio sound. By upsampling to 32bit 1.5Mhz, theoretically there is enough headroom to make the bit loss inaudible at least for the upper range. But is it really as good as an analog volume control? 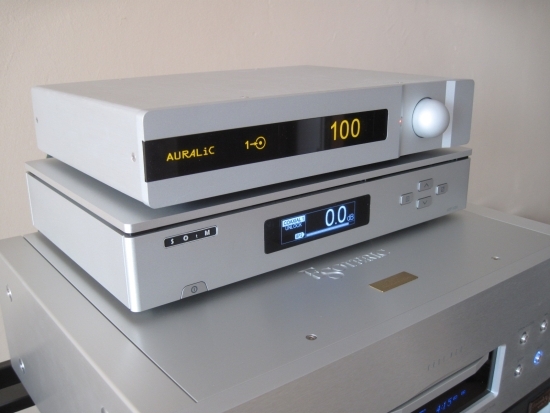 I didn’t try this myself, but this is what Auralic say themselves: “In the final analysis I don’t believe that current digital volume, even ours, compares to high-end analog types. But it’s already superior to most ordinary preamps. If you’re seeking true high-end sound or very steep attenuation rates, you’re still better served with a well-designed analog preamp”. As always, it is a matter of how much you are willing to spend. There’s a lot to say for the simplicity of a built-in digital volume control but I prefer the added magic of my Jeff Rowland Coherence II preamp but this comes at a steep price. Once again I am not convinced by the quality of DSD playback through an external DAC. This time I used the AAZ Ultra Flow music server as a source and a bunch of DSD files from different origine than the ones I used previously when auitioning the Mytek 192DSD. Yes, there’s added resolution and more air in the treble, with less harshness. But bass is thin and lacks colour and drive, and so does the lower midrange. For comparison I also played all the hybrid SACD’s that I had in the Esoteric X03 SACD player that is also visiting for a review. An extensive review is in the making, but in short I can say that this time, SACDs do definitely have their place and for once, bass is still forcefull and midrange still colourful. 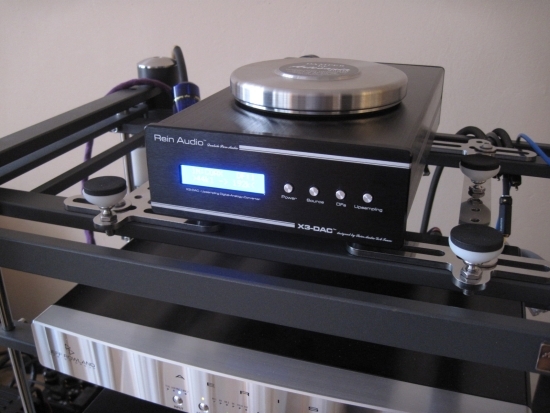 So, for some reason, DSD files played on computer-based servers (be it a Macbook Pro or an otherwise superb AAZ Ultra Flow), don’t sound anywhere near as good as a real SACD on a high end SACD player. Now it was time for the optimising-session. I wanted to retrieve the best sound from the Vega, main objective being to optimise timbre and in doing so, to minimize the feeling of artifice. First item to swap was the Isotek EVO3 Elite powercord. Funny thing is: although the Isotek is a little thinner, it has the exact same colour and material type as the vdH Mainsstream, and, it seems to possess a similar quality to the sound that I also heard with the vdH, namely that feeling of artifice that I was talking about above. Incidentally, I spoke with the distributor and it is apparently a cable made especially for Isotek. Nevertheless, I felt that the combination with the Vega wasn’t perfect so I removed the Isotek and replaced it with a Harmonic Technology Pro ACII+. My hunch was right: the feeling of unnatural timbre was now reduced. But also was the speed and articulation. Just like I remember the vdH Mainsstream to sound, the Isotek instills excellent transient speed and articulation, as well as impressive transparency, without tipping over into sharpness or hardness. But, also like the Mainsstream, I don’t find it to sound very natural. Again: many people might not hear it like this but to me, having compared many, many components and cables, this is how I hear it. Substituting the Harmonic Tech II+ again for a Furutech Alpha 3 reset the balance for articulation and speed without adding artifice but on its turn it added a technical quality and a little dryness. So, out went the Audioquest Diamond USB cable and in came the Elijah Audio Quad Braid. That seemed to do the trick by allowing for a wider soundstage and a more colourful sound overall, but at the expense of transient speed in the upper bass. Darn. This one was tough to get right. Back in came the Diamond USB but with another power cord, a Lapp 191CY. The Lapp sounds a little thick in the bass but it has very good flow and drive, and when I repositioned it to the other extensionblock (wired with installation wire instead of Lapp), the balance was perfect. Set up like this, the Vega sounded transparent, fluid, refined and neutral all at once. And bass was very good: powerful, deep and fast. The interlinks so far had been Transparent Ultra XL XLR’s and although the Vega could easily handle them (some output stages are less happy driving Transparent cables), a more natural sound was achieved by using Cardas Hexlink Golden 5C interlinks. Playing this way, that feeling of artifice, although still present, was now minimised. But the Cardas also diminished apparent resolution and imaging. So back in came the Ultra XL. Long story short: I liked the Vega best with Transparent Ultra XL XLR interlinks, the full-bodied Lapp 191CY 7G1,5 powercable and the very open Audioquest Diamond USB cable. It might sound even better with other analog interlinks, Cardas Clear springs to mind. 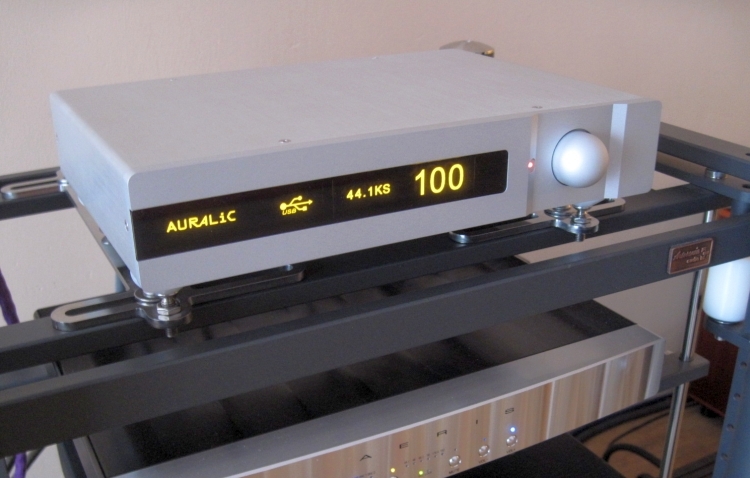 The Auralic Vega is an unusually finely resolving DAC, for resolution easily on par with the best I’ve heard and it manages to do this without tipping over into an over-analytical sound. Its timbre doesn’t quite convince me but apart from that, the Vega actually does everything else extremely well, and adds DSD compatibility, too. It operates like a dream and has a superbly bright and easily readable display.